Weathervanes, the recently released debut album from New York band Freelance Whales, is a strange and ambitious attempt to translate childhood memories and dreamlike visions into a coherent musical narrative. It’s a document about transition: from adolescence to adulthood, from dependence to independence. Tellingly, Hannah Takes The Stairs, Joe Swanberg’s 2007 mumblecore touchstone movie, gets a song of its own (“Hannah”). The theme carries through the quintet’s sound. Glockenspiels and vocal harmonies—not to mention all that lyrical innocence—call to mind kinder-core acts like The Boy Least Likely To, but it’s offset by an orchestral bombast that’s big, bold, and often quite surprising. 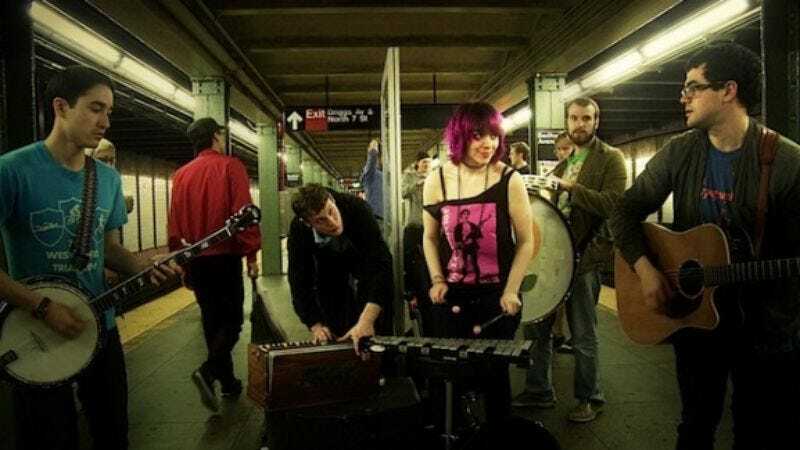 In advance of Freelance Whales' show at The Black Cat Backstage on Thursday, January 21, The A.V. Club spoke with frontman and founder Judah Dadone about dreams, making music unconsciously, and the absurdity that is his band’s name. The A.V. Club: How did you conceive Freelance Whales? Judah Dadone: It really started happening in August of 2008, shortly after I moved to New York. I was an English and creative writing student, and I had a professor who suggested that I start a dream log. So I went through a period of my life where I became fixated on logging dreams. When I came to New York, I was using that as a starting point for music. I had mocked-up a few songs and put them on a MySpace page, and then I linked that page to a Craigslist post inviting people to get involved. The five of us emerged a little bit later. AVC: What were your criteria for selecting bandmates? JD: I wanted to find a group where everyone was willing to try to play new instruments. The songs were originally based on a little collection of instruments. AVC: How do you go about selecting a given song’s orchestral palette? JD: Our rehearsal space is set up a little bit like a playroom, and the idea is that we have a whole bunch of instruments. Maybe one person starts playing something on the bells, and then hopefully the rest of us listen, process, and respond. Then someone will go over to another instrument, and play a part on top of that. We’ll start like that and build it little by little, and hopefully a song comes out of that. It’s a writing exercise for us, and a way of connecting and communing as a band. A lot of us come from a space of writing more traditionally—of sitting down at a piano and writing a melody and lyrics—and now we’re trying to deconstruct that and take ourselves out of our comfort zones. And experiment with instruments that we’ve never played before, if for no other reason than because if you sit down at a new instrument—especially if you don’t know the music theory behind it—it really helps to reconnect with the magic and mystery of music. It’s an un-training process, of trying to get back in touch with what we love about music. AVC: There are innocent, almost childlike elements to many of the songs on Weathervanes, both sonically and in the perspectives embodied by the young characters that populate your songs. JD: I’m glad it came across that way. I think that’s the way it feels for me, as well. I can’t say it was totally intended, but what makes it feel that way is, quite literally, there were very few decisions we made on this record that were conscious. I felt like it was the first time for me as a musician where I was really relying on my subconscious, and using dreams as inspiration. And I know there’s a lot of regression in dreams, and my main regression was going back to a space in a home I lived in during my early childhood, and I felt like I was discovering new rooms in a place I’d lived before. This wonderful feeling of, “I didn’t know this room was here, but it is, and it’s so grand!” That’s one of the only reoccurring dreams I’ve had, and it became the foundation of this record. If I were to try to interpret Weathervanes, it feels like a preadolescent love story between a young boy who has fallen in love with a female ghost who’s haunting his house. That’s how I feel about it now, but that’s not necessarily what I was shooting for. Throughout the process, I was unable to make conscious decisions. It was about letting the words come out, and also the music. AVC: Freelance Whales is a very funny band name, in the manner of a ripe non-sequitur. How did you come up with it? JD: We didn’t realize it would be perceived as comical. There are some people who think it’s some sort of weak attempt at humor, but it’s something that came from my early childhood. It’s related to a near-death experience I had. I grew up in Israel for part of my early childhood, on the Sea of Galilee, and I spent a lot of time on the water. My dad and his brother were Israeli Frogmen, which is the Israeli equivalent of Navy Seals, and they did a lot of skin-diving. I really admired them and always wanted to prove that I could dive deep. So one day I dove down really far to retrieve a rock, to show them that I could. I’d gone down, and it was getting deeper and darker and colder, and I finally got to the bottom and I sunk my hand into this mud. When I got to the surface I was carrying this big rock, and I was sort of drowning. A lifeguard dove in and pulled me to the shore, and I noticed when he pulled me to the shore that there were leeches all over my body. The lifeguard had this trick for removing the leeches. He’d tickle their bellies, and they’d retract their syringes. There was an old fisherman sitting nearby, and he was laughing to himself about the situation, like he’d admired my effort. And in Hebrew he called me something like a “Freedom Whale,” or “Liberty Whale.” And I translated that in my head to Freelance Whales. It’s a very strange, surreal memory, and sometimes I wonder whether I’m remembering it accurately. Every time you think about a memory, you edit it in strange ways. But it also has a certain relevance. When you write, you’re bringing something to the surface.